Please call 1 (855) 615-5740 to report your credit card lost or stolen, or if you suspect that there has been fraud. Stop losing money with high interest credit cards. Helpful Money Saving Tip: Save even more money by transferring high rate credit card balances from other lenders to your lower rate DuGood credit card. Earn Rewards For Everyday Credit Card Purchases. Relax with additional credit card protection. Enjoy an extra layer of security when you add your credit card to Apple Pay, Google Pay, Samsung Pay, or Masterpass. Your card number will never be shared with merchants or stored on a server. CardValet is a free mobile app that allows you to turn your credit card on and off, set restrictions on where your card can be used, establish spending limits, and so much more. We've partnered with MasterCard to give you additional protection against unauthorized use of your credit card when you shop online. Are you ready to get a credit card ? 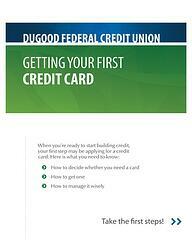 Visit your nearest DuGood branch for FAST, EASY APPROVALS and leave with your new Credit Card in hand! It breaks down the whole process step by step. Inside, you'll learn how to decide whether you need a credit card, how to get one, how to manage it wisely, and more! How do I activate my credit card or change my credit card PIN? Please call (855) 615-5740 to activate a credit card or change your credit card PIN. Please call (855) 615-5740 to report a lost or stolen credit card. Where do I pay my credit card bill? Log in to online banking and select your credit card account on the My Accounts screen of online banking. Here, you will be able to view your statements, transaction history, and pay your bill. Does your credit card offer any insurance protection for rentals or luggage when traveling? No. Our credit cards do not offer any type of insurance for rentals or luggage at this time. Stop by your local branch, and you may be able to get approved in just a few minutes and walk out the door with your card. Mailed credit cards should be receive it in 7-10 business days after approval. Regular rates vary from 9.90% - 18.00%.